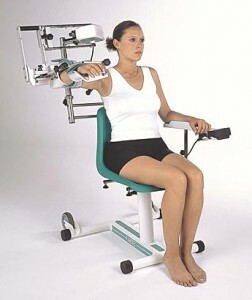 The Kinetec Centura Anatomical Shoulder CPM Machine is the ideal choice for hospital and home shoulder rehabilitation. The Kinetec Centura features a natural, anatomical motion that increases patient compliance and decreases joint stress. The post-operative passive range of motion helps prevent joint stiffness, edema, soft tissue contractures and muscle atrophy. Controlled synchronized motion ensures patient safety. Can be programmed to reverse itself when excessive force is exerted on the joint.